This is such a simple chicken recipe, that it risked being called “Chicken With No Name.” It is endlessly adaptable, depending on available ingredients, personal preferences, time and circumstances. I have made it several times over the past few weeks, and it is always a hit. Optional: 1-2 parsnips, or other vegetables. Don’t add too many vegetables, or else the chicken will be overwhelmed. The more simple, the better the outcome. Salt, to taste. 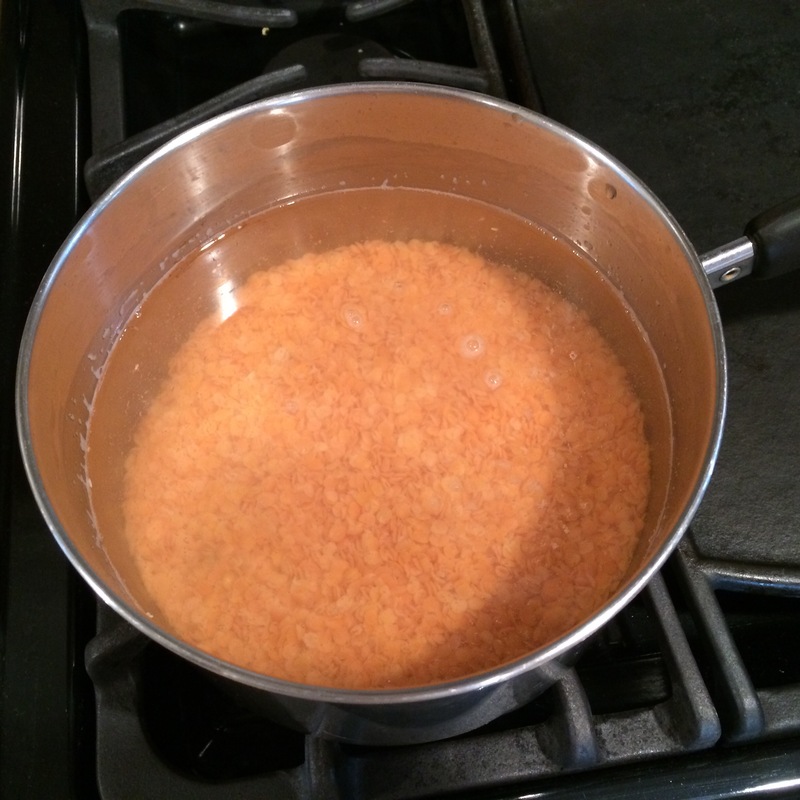 Add the salt sparingly after it is cooked. Kosher chicken tends to be salty, and too much salt ruins the flavor. Optional: Thicken broth with 1-2 tablespoons of flour or starch. I usually dissolve the starch in a small amount of broth, and then add it to the dish and simmer until thickened. Place carrots, onions, and celery in the bottom of the pot. If you have the time, you could saute the vegetables until browned, however, I did not. Add the chicken pieces on top of the vegetables and sprinkle with pepper, garlic powder, and if using, paprika or other desired spices. Then add the liquid, and, the (optional) tomato puree or paste. 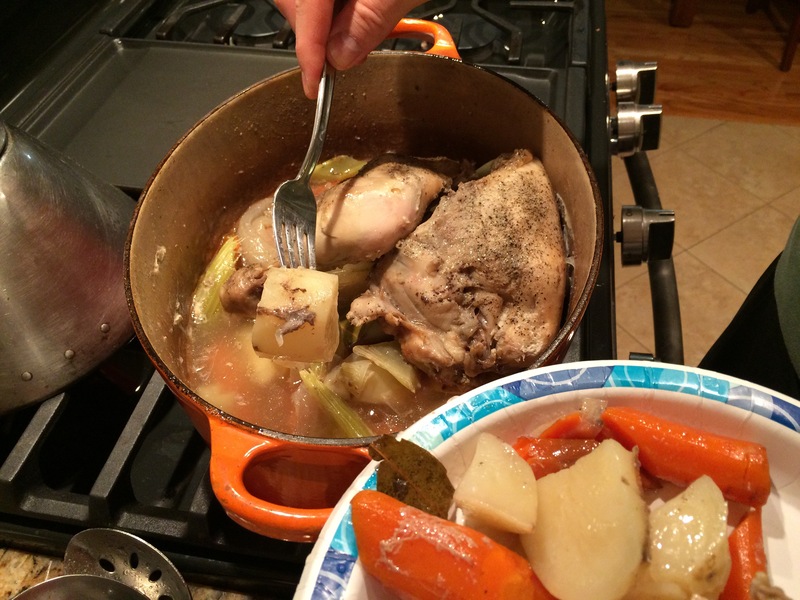 I place the chicken on top of the vegetables so that the stock almost steams or roasts the chicken. 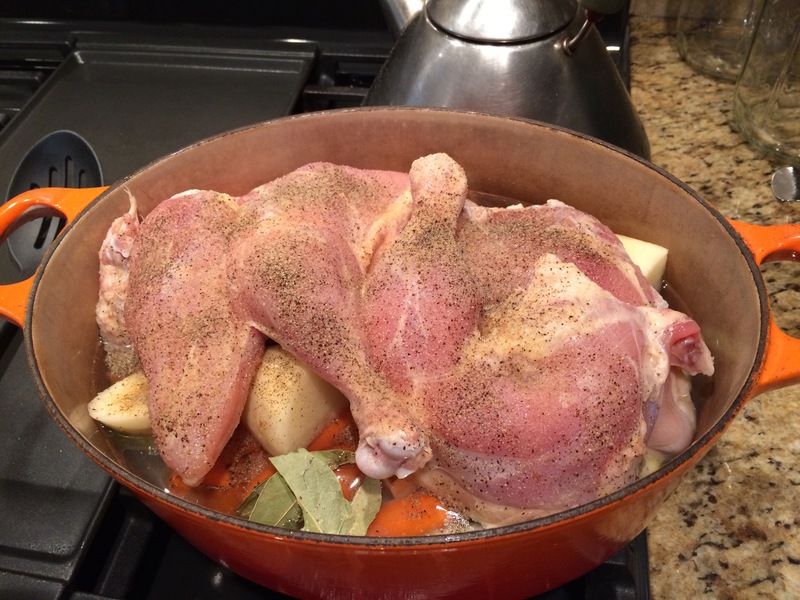 The secret is to cook the chicken with only a minimal amount of liquid or stock. And, only add a minimal amount of salt after it is cooked. Too much salt, or liquid, and the taste is altered. I also only add crushed fresh garlic at the end. In general, less is more with this chicken recipe. The beauty is in its simplicity. Stove top: bring to boil and let simmer until done. Add crushed garlic, salt and adjust seasonings to taste. Crockpot. Cook on low until done. Add crushed garlic, salt and adjust seasonings to taste. In pressure cooker: 7 minutes to pressure and then use the quick release method by running cold water over the lid when done. Add crushed garlic, salt and adjust seasonings to taste. This week, I made it in the crockpot overnight. I adjusted the seasonings when I got up this morning before going to work. I forgot to take a picture of it in the crockpot. So, I only have pictures when I made it on the stove top. Layered in the pot before cooking. I see I added parsnips too. 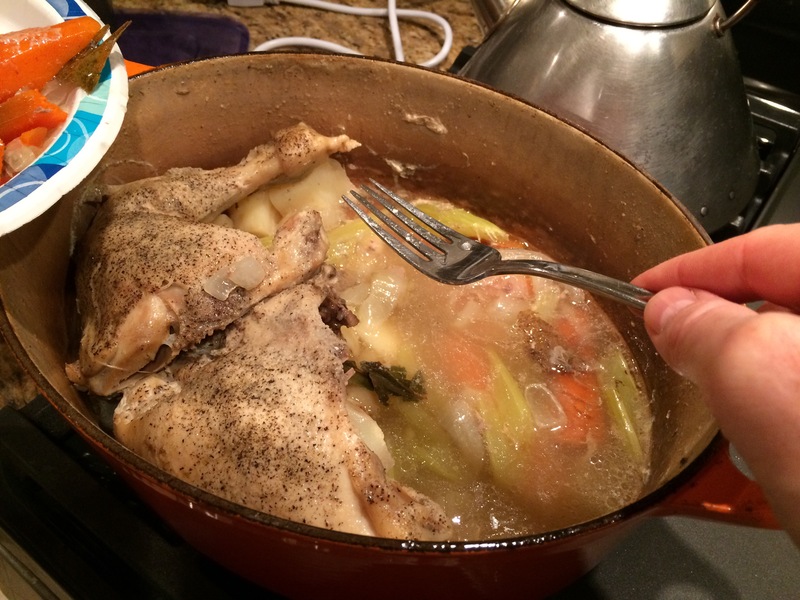 The first time around, my husband ate straight from the pot! Another live action shot of Jay eating from the pot. Everyone was soooooo happy! Raizel said, “I am obsessed with this chicken. It is scary good!” My husband said, “This chicken is killer!” It is one of the few times that there were actually no leftovers. 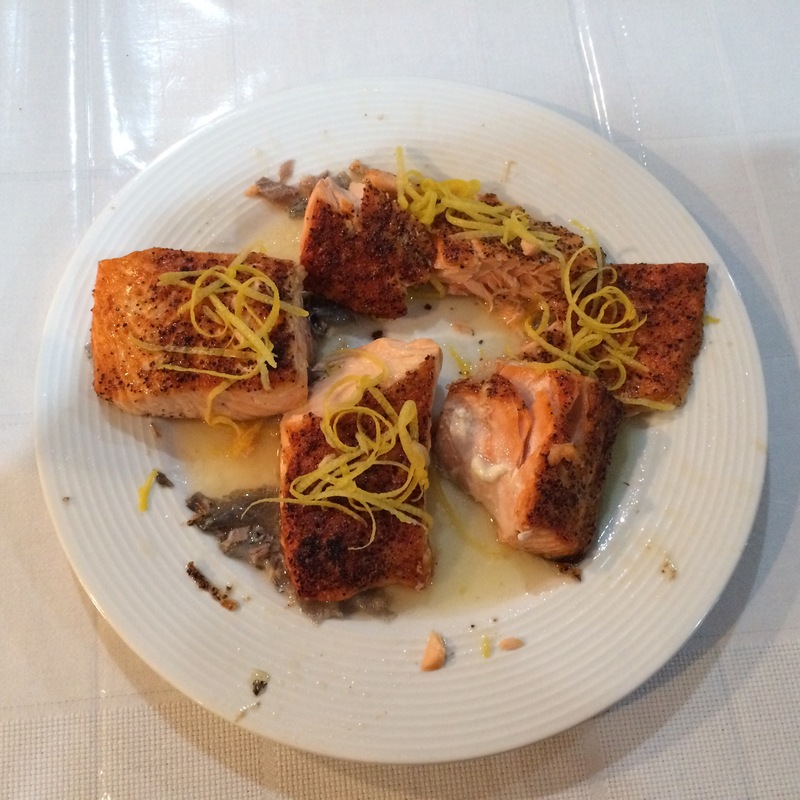 It is fast, easy, all natural and simple — cooking for the time challenged at its best. I am very excited about this recipe. Since we try to have 1 plant based meal a day, I am always looking to create simple, fast and easy vegan recipes. This is an adaption of my Chicken and Carrots recipe. Lima beans were easily substituted for the chicken with success! 2 cups carrots, sliced on the diagonal, or use baby carrots. I personally do not like baby carrots, as I feel they are less flavorful and crisp. 6 cups wine, broth or water. 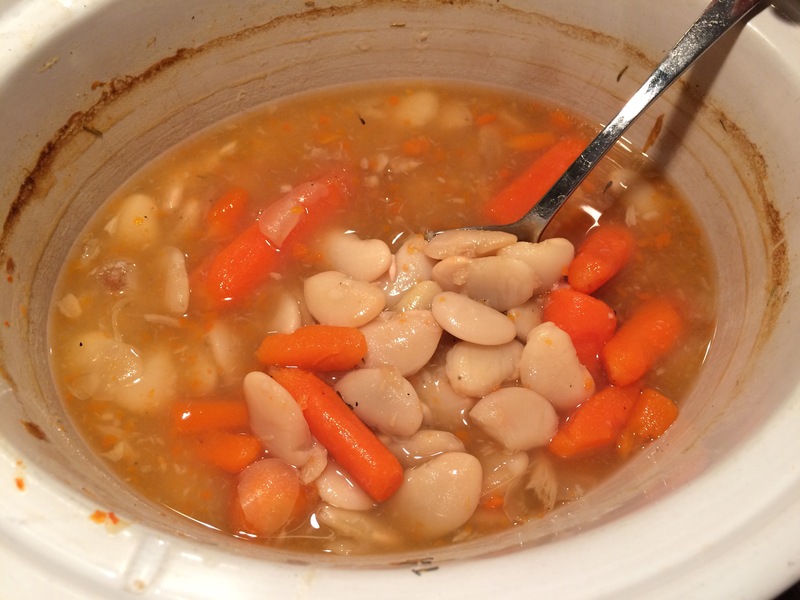 Place beans, carrots and garlic in pot. Add salt, pepper, thyme and water water. Cook on low. Crock pot: Cook on low until done. Less water is required. Adjust seasoning. Stove top: bring to boil and let simmer until done. Adjust seasoning. Pressure Cooker: 12 minutes to pressure and then release the pressure quickly by running cold water over the lid when done. Adjust seasoning. I call this maximum taste for minimal effort. A winner! Just completed, and in the crockpot. I wanted people to see the actual beans. Yum! Everyone liked it. I am so happy! Please excuse the double posting of this recipe. For some reason, I posted this recipe today, but, rather than posting with today’s date, it backdated it. In the past, when this occurred, it caused an error message. So, I am posting it again, in an attempt to help fix the error. 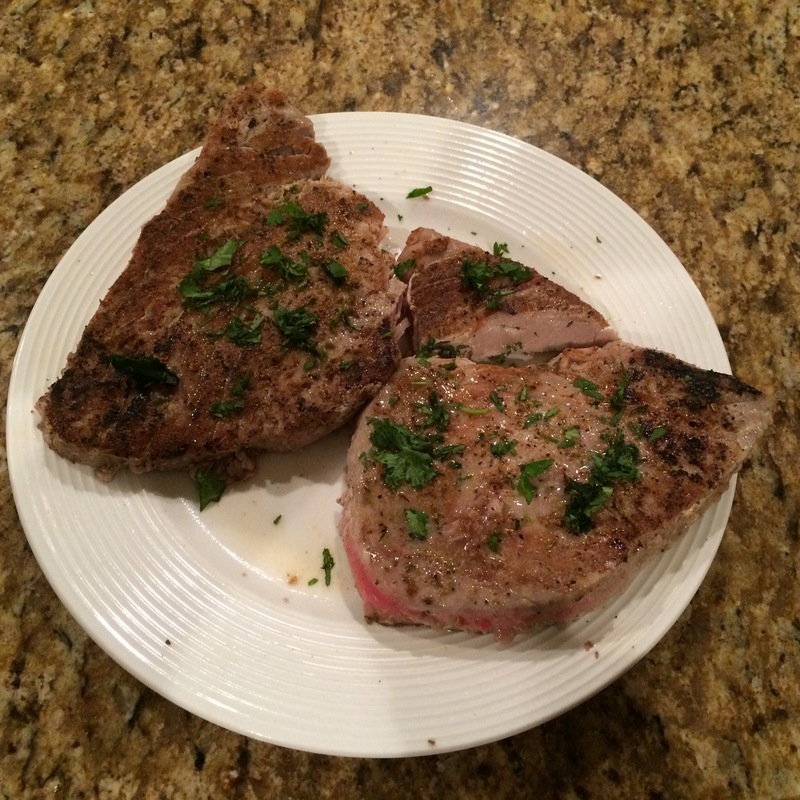 During the 9 Days, I learned how to cook fresh tuna steaks successfully for the first time. In the past, I have only rarely tried to make fresh tuna. And, the few times when I did, it came out very dry and without flavor. This time, I searched online for how to cook fresh tuna. I think that it really helped me to understand how to cook fresh tuna better. 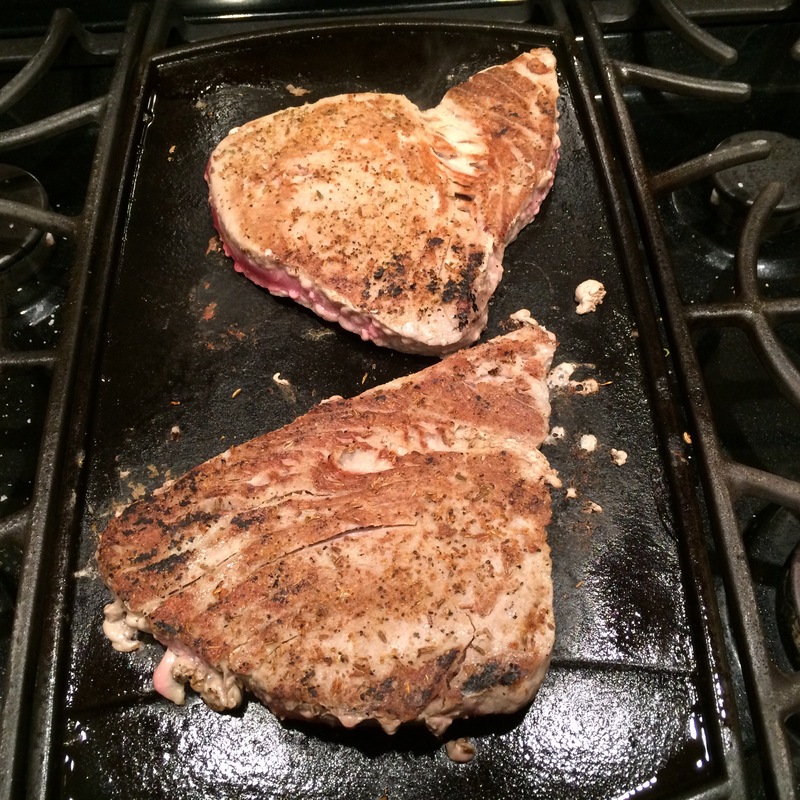 In addition, I used the stovetop grill on our new stove. Everything tastes better grilled on cast iron. 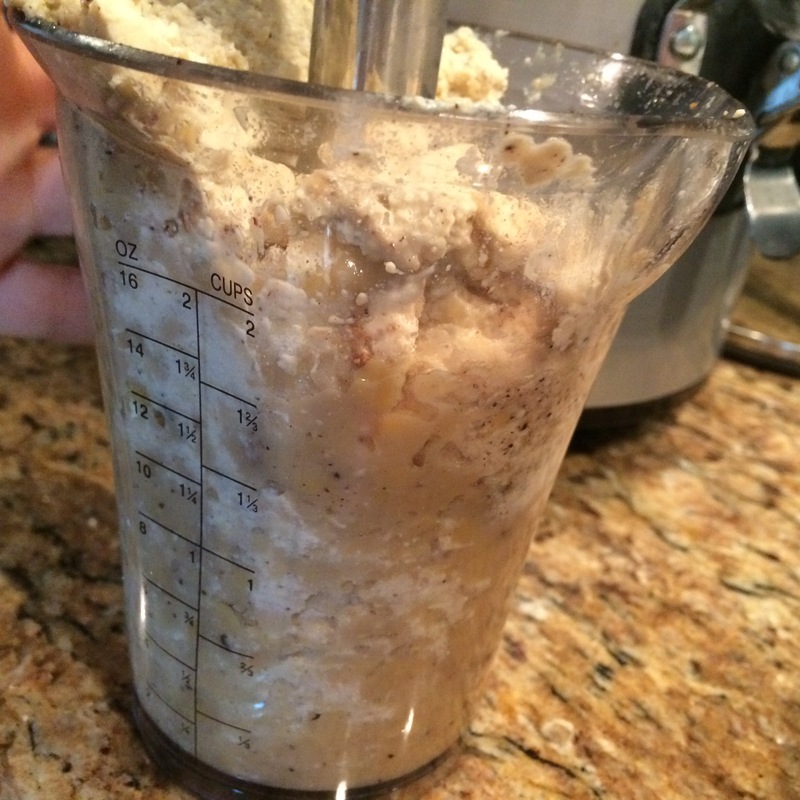 This recipe is based on the sites that I found, and the links are posted below. 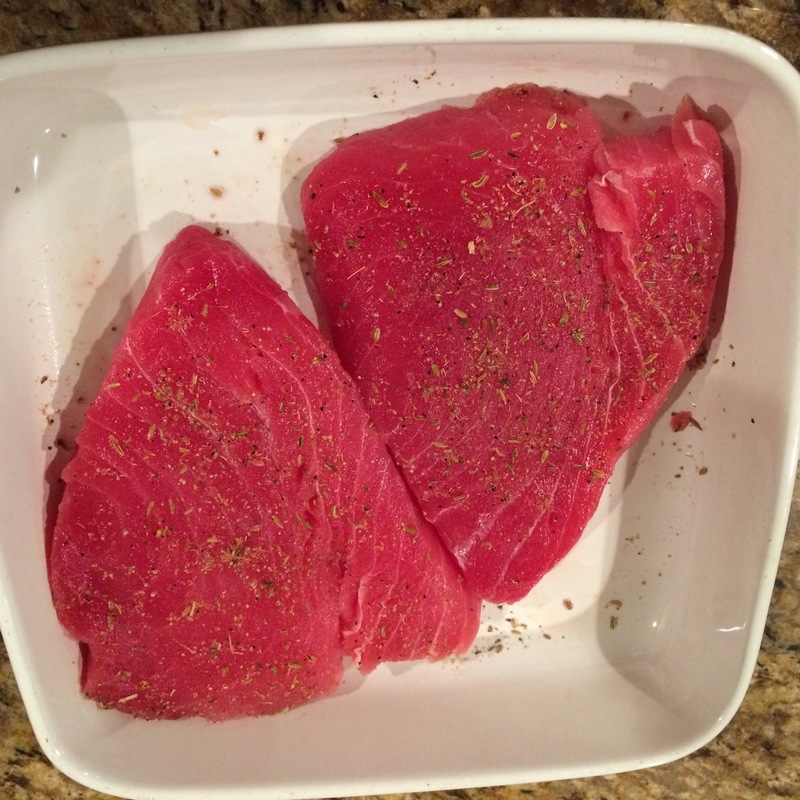 According to what I read online, the key to grilling fresh tuna is to only cook it for 4-6 minutes per 1/2 inch stake. Since I was concerned about over cooking it, I only cooked it for 4 minutes per side. 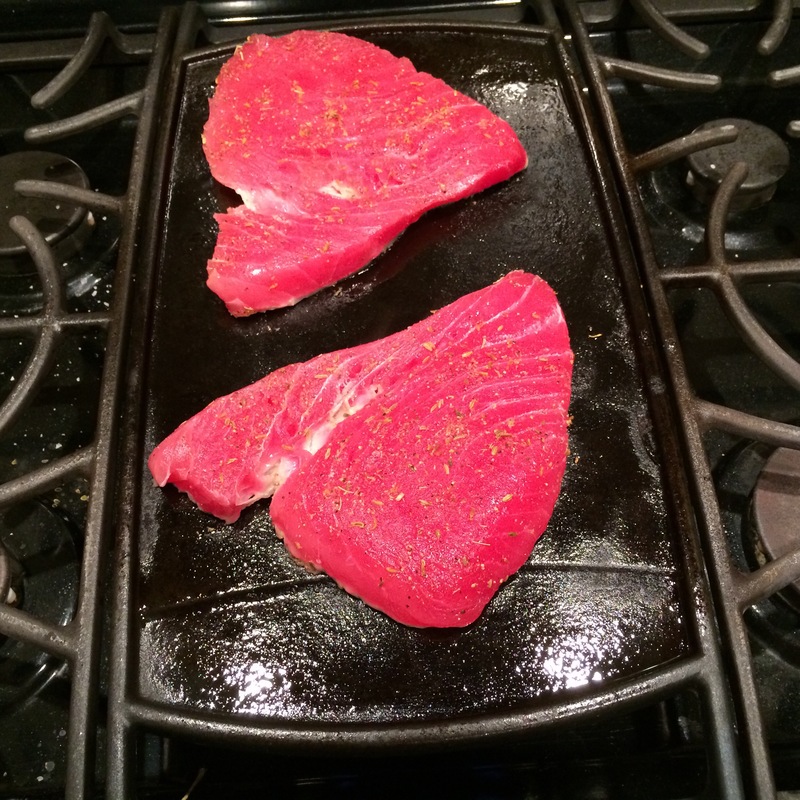 I have discovered that cooking tuna is a little like cooking a medium steak: you want to have a layer of pink inside. Blend spices together. I do not have a mortar and pestle so I used a wooden rolling pin and crushed the spices. Heat grill on high. Spray oil the grill. 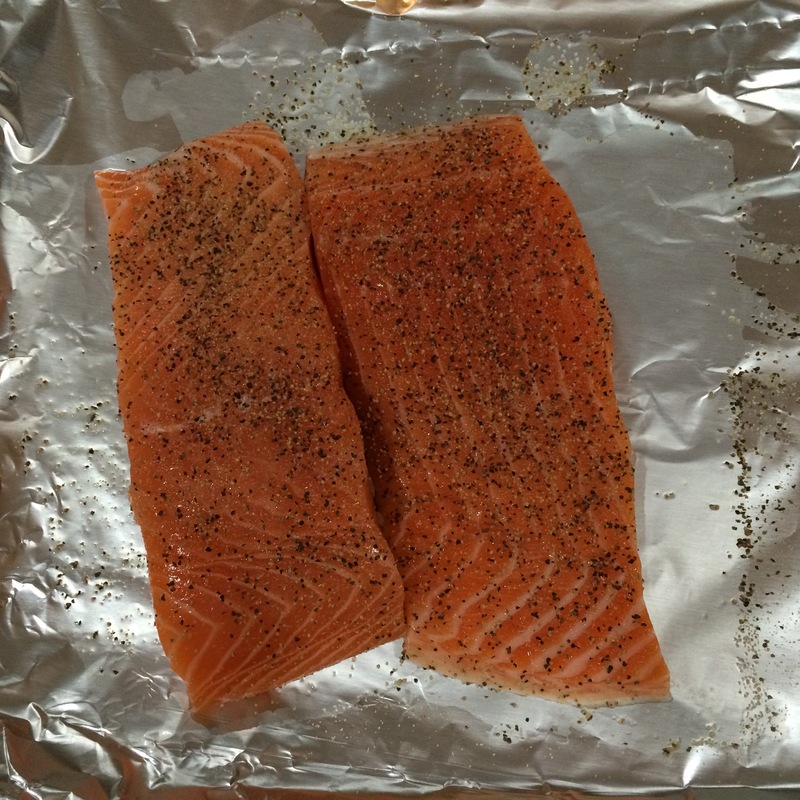 When hot, place fish on grill, 4 minutes per side. When done, add lemon juice and fresh herbs. I set the timer for 4 minutes and I really think that’s what made the difference. Rather than guessing, it made it more precise and hopefully more predictable outcome. Successfully flipped over and cooking the second side. A ringing endorsement. This recipe is definitely husband approved. During the 9 Days, which just passed, we do not eat meat or poultry. Instead, fish becomes a staple. It’s simple, fast and easy, with a touch of elegance. Rinse fish and place on tray. Sprinkle pepper and garlic to taste. Zest and juice a lemon and if using a lime. While fish is still warm, pour zest and lemon and/or lime juice over fish. Voila! Fast, easy, all natural fish with a gourmet touch. final product. My husband liked it so much, he took a bite before I could take a picture. This recipe is a hit every time! Needless to say, it was gone by the next day. The blogging world has opened up so many new culinary opportunities. I adapted the recipe based on The Eggplant Napoleon recipe posted by Dolly, who is behind the apron of koolkosherkitchen.wordpress.com. However, I must apologize for an inadvertent culinary faux pas: Lentils Napoleon is really a misnomer. Through this joint post, I have learned that my lentil dish should have been named Lentils with Cumin and Sumac. And, how did I learn this? Because Dolly, who is a dedicated teacher, kindly reminded me that “Napoleon” really refers to anything baked in thin layers interspersed with something creamy. My lentil dish was certainly not that. I simply liked the spices she used and thought I would use lentils instead. BUT, my malapropism has led to this current hands-on learning experience. Dolly is a genuine educator: she suggested that we do a joint post on a “real” Lentils Napoleon. Our goal is to post as simultaneously as possible both of our recipes, using the culinary concept of layering vegetables interspersed with something creamy, the real culinary definition of Napoleon-style dishes. For me, this has been a real opportunity to see how unique we all are. 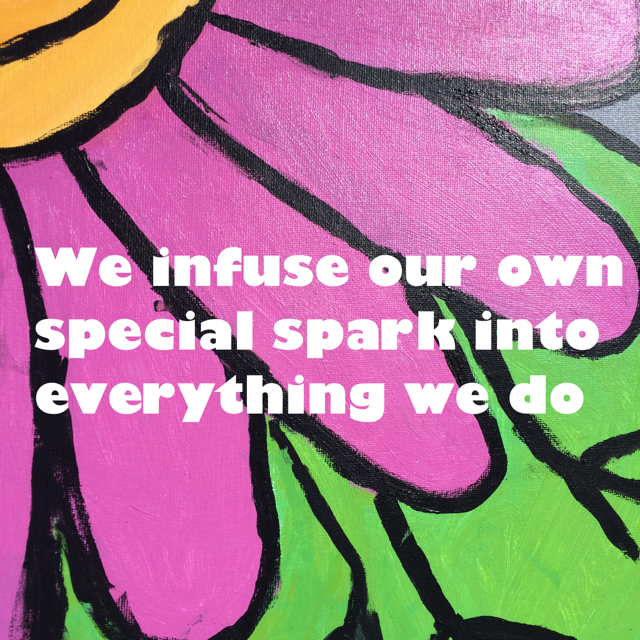 We infuse our own special spark into everything we do. Based on a more careful reading of Dolly’s post, and some online research, I discovered that Wolfgang Puck, the original creator of Beets Napoleon, used goat cheese between layers of beets. 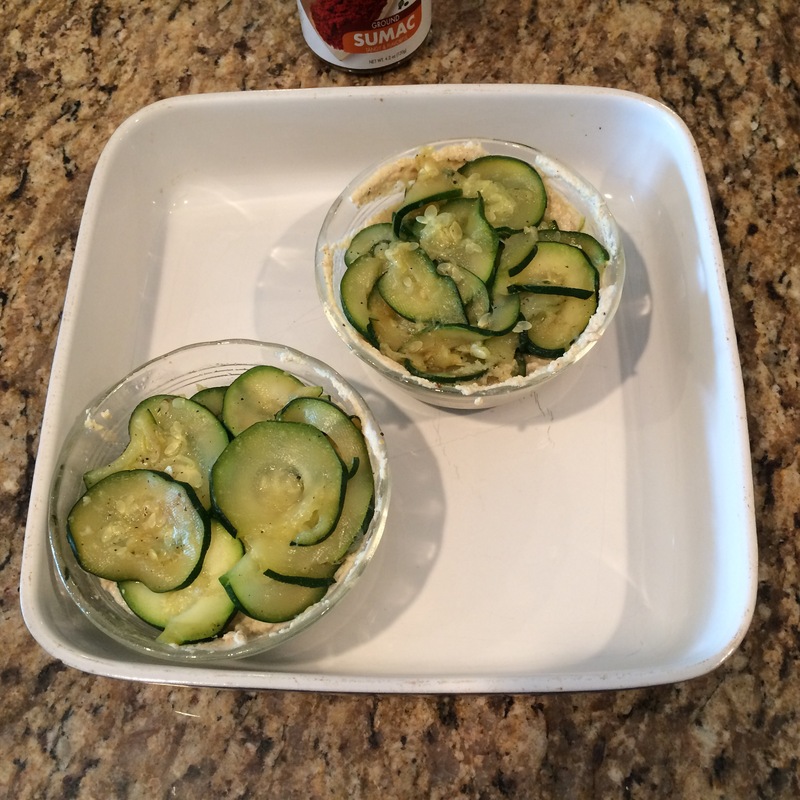 For this post, I decided to use thinly sliced zucchini between a tofu-lentil creamy layer. 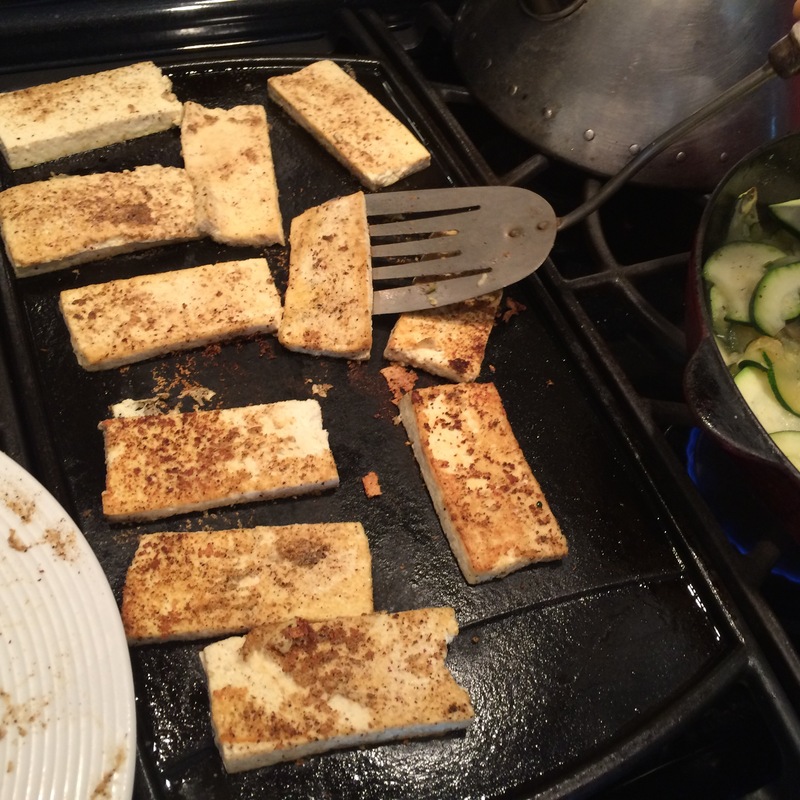 I thought that tofu, with a dash of vinegar, would recreate a more goat cheese-like texture. In addition, I had run out of lentils, and I didn’t feel like shopping for more. Raizel was my hands-on helper in this activity. She came home from camp this week, and was very excited when I suggested we make this dish for our joint post. Raizel helped with the actual cooking, and she also took some of the photos. Raizel has a unique gift for coming up with recipes that are often quite good. But, photography is one of her passions; and of course, she loved using my phone as a camera! Vinegar to taste, in order to get a slightly tangy taste for the tofu. I used red wine vinegar, but I think that apple cider vinegar would be good too. 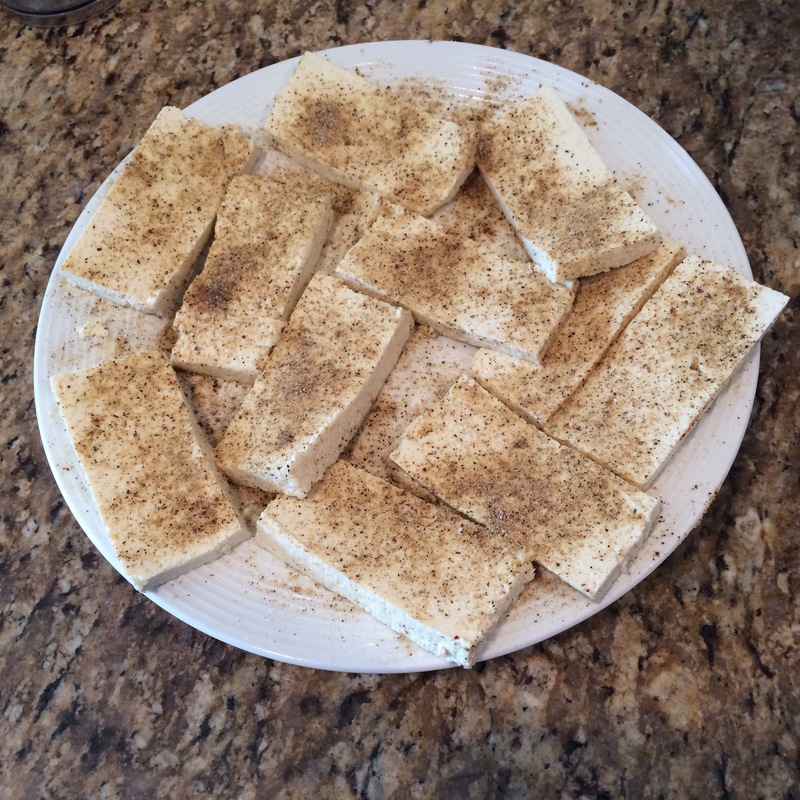 Lentil Tofu Creamy layer: Slice the tofu about 5 mm thick and sprinkle spices on top. 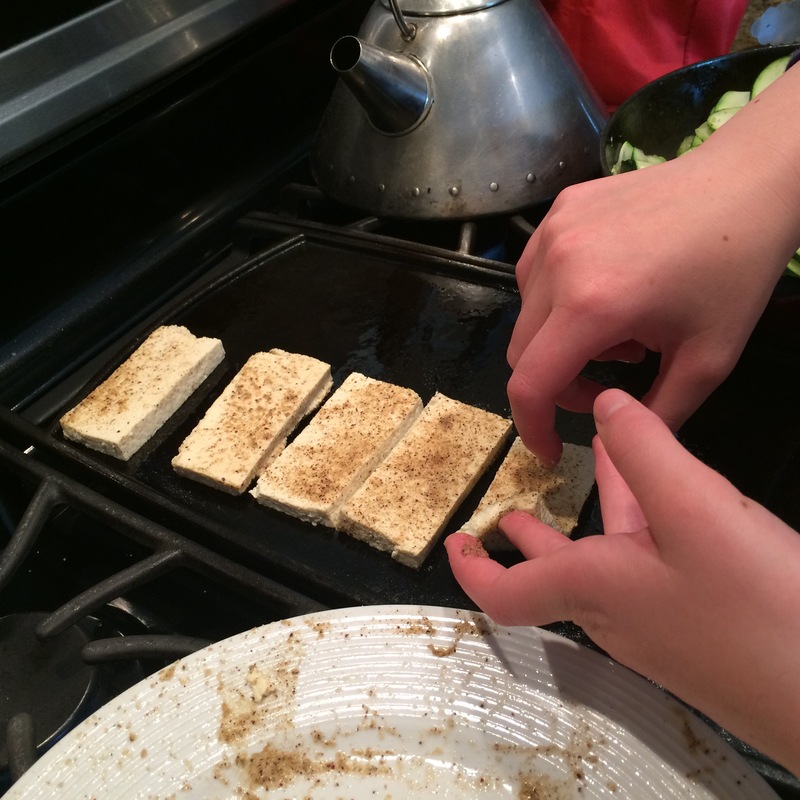 Spray oil grill, and cook the tofu until done. I took the leftover lentils from when I first posted the recipe and pureed it together with the tofu and added the vinegar. 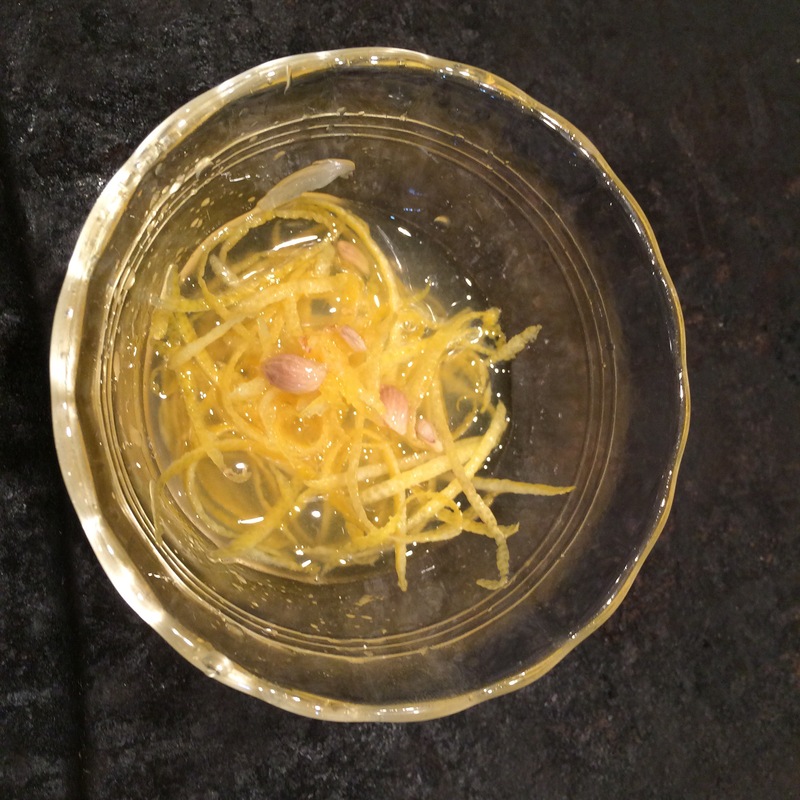 The vinegar gives it a nice tang and a creamy texture. Then I adjusted the seasoning. Vegetable layer: Slice the zucchini is thin slices. 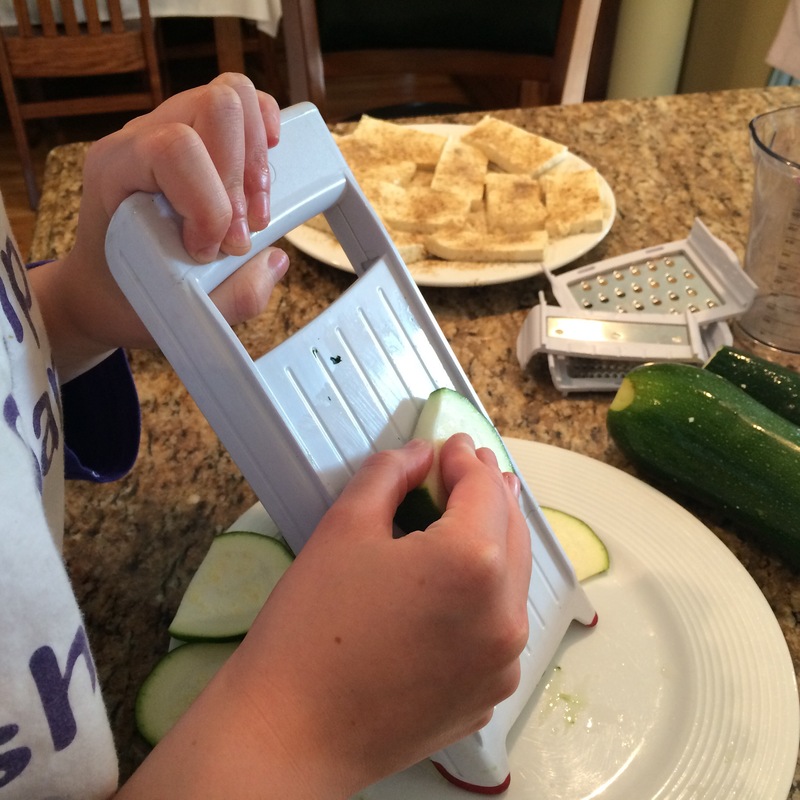 I have a wonderful compact grater/slicer that I used. It is very sharp and is able to slice 2 different thickness. It also has 3 blades for various grating. Raizel actually sliced the zucchini and she did it very well! 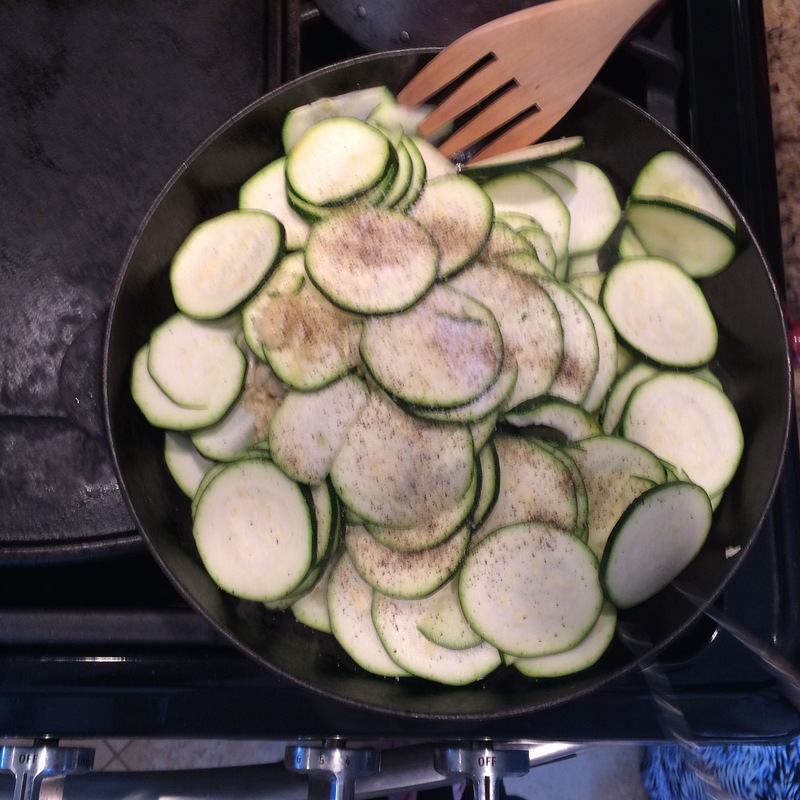 Sauté zucchini in pan, sprayed with olive oil. Add crushed garlic and salt and pepper to taste. 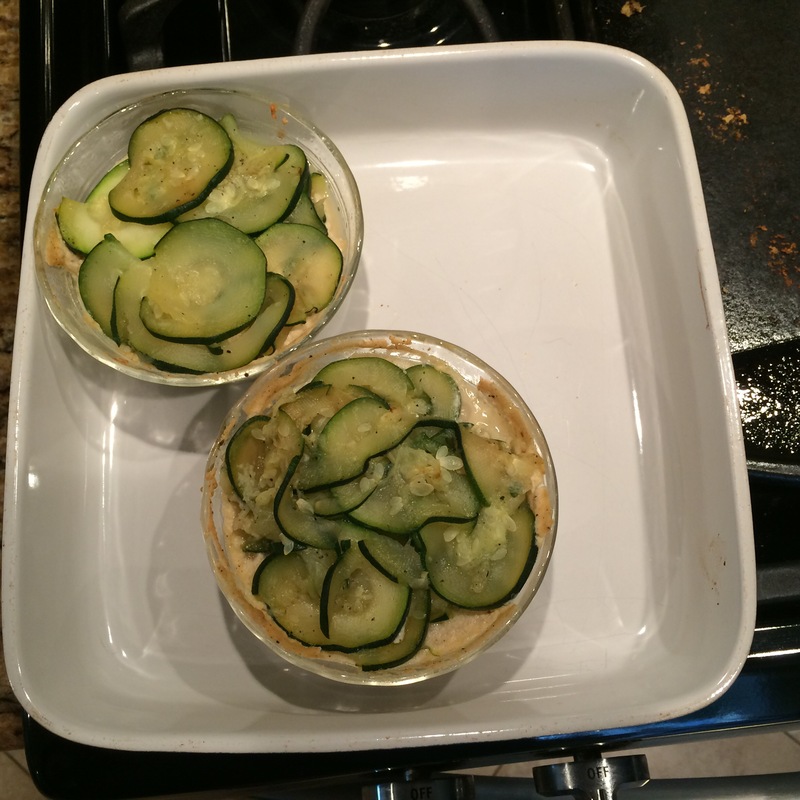 Layer zucchini in a small, lightly oiled dish. Next add layer of tofu-lentils, and continuing layering until near the top. Top layer should be of zucchini. Bake covered for 20 minutes or until cooked. I made this in individual servings. I think that it could be made in a larger pan, and then sliced when cooked. However, it might be difficult to maintain the desired layered look. Wolfgang Puck, I believe, used a cookie cutter to get a uniform and attractive serving portion. 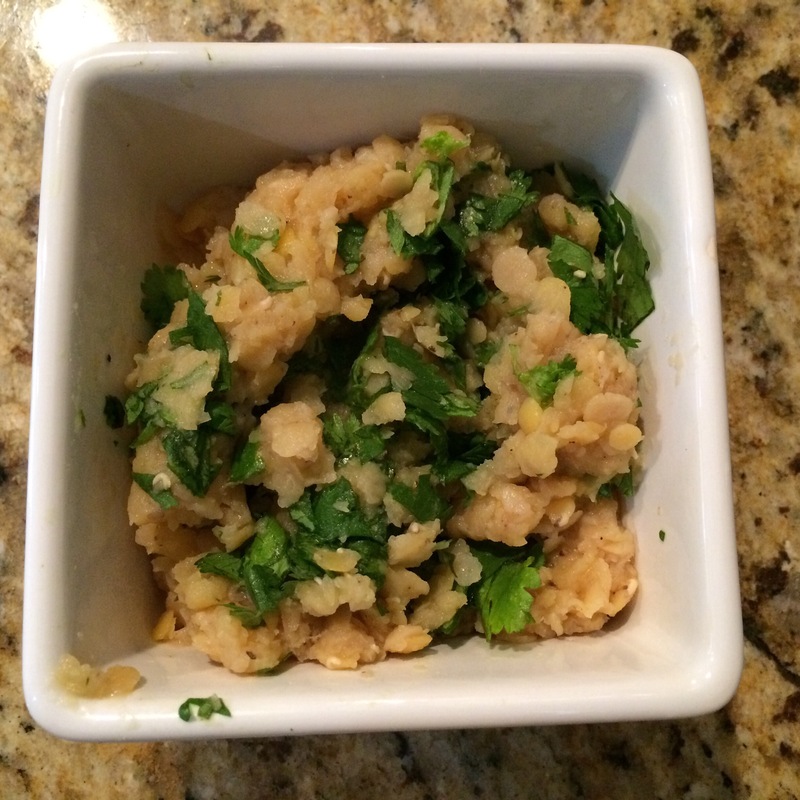 Serve with chopped fresh cilantro if desired. Here are the pictures. Since I made it with Raizel and she likes photography, we took quite a few. Tofu marinating with the spices. Raizel slicing the zucchini. Go Raizel! Raizel placing the tofu on the grill. Raizel cooked the tofu by herself! The verdict: The recipe objectively came out great. However, subjectively, is was not well received. After it was so beautifully prepared, my husband reminded me that he does not like anything creamy. Raizel, who was very excited and very enthusiastic during the whole process, also didn’t eat it. Despite her protestations, Raizel does not like anything creamy either. In the end, I was the only one who ate it. I thought it tasted great. I also ate the leftover tofu “cream” during the week, as a spread on rice cakes. Overall, I would say that this recipe is delicious, but for someone else’s family. I have my own song in the kitchen. 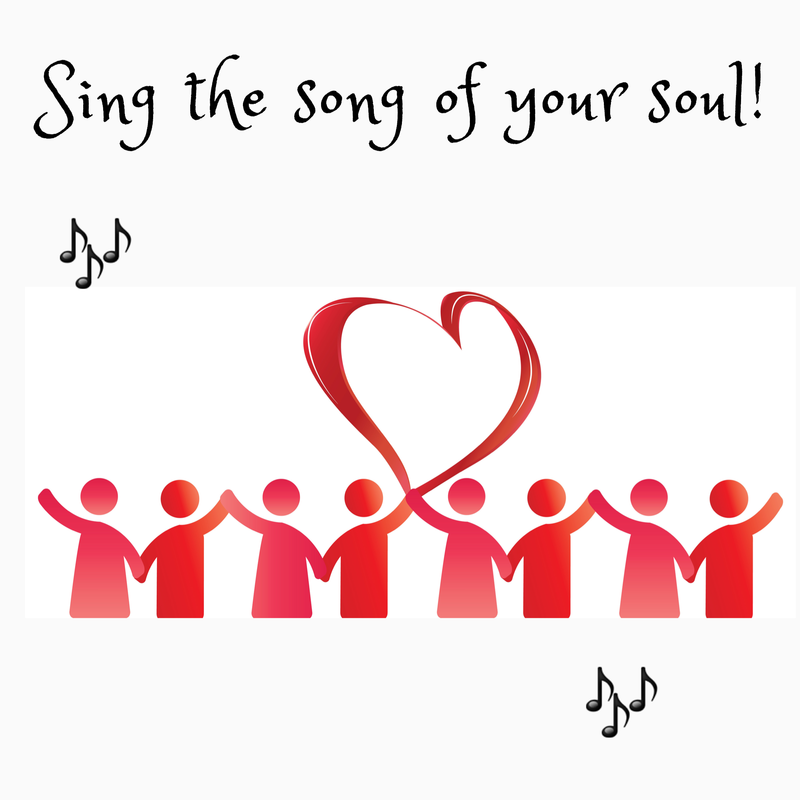 Everyone has their own song. For my family, simple is best. Finally, I had lots of fun discussing and planning this with Dolly. We had a bonding experience!Thank you Dolly! A ringing endorsement. 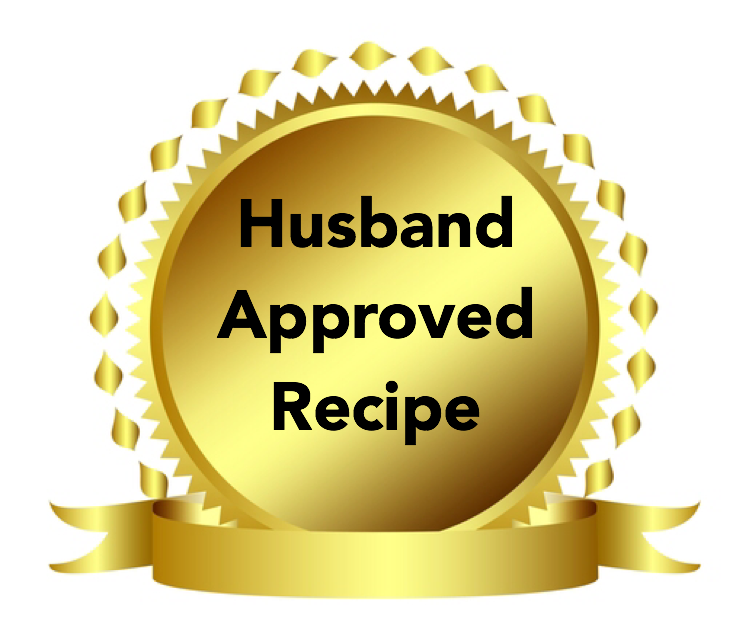 This recipe is husband approved. I wanted to make something fast, easy, and flavorful, which also included sumac. Before blogging, I had never heard about this spice. Now, however, Raizel, my budding gourmet, loves it! She often requests recipes with sumac, and she will even suggest a recipe so that I can specifically include it. Dolly said that sumac has a lemony taste. That was how I enticed my husband to try it. Raizel and I are also big fans of cumin. So, I took the spice combination that Dolly used for the eggplant and substituted lentils instead. I suspect that other beans could be used too. 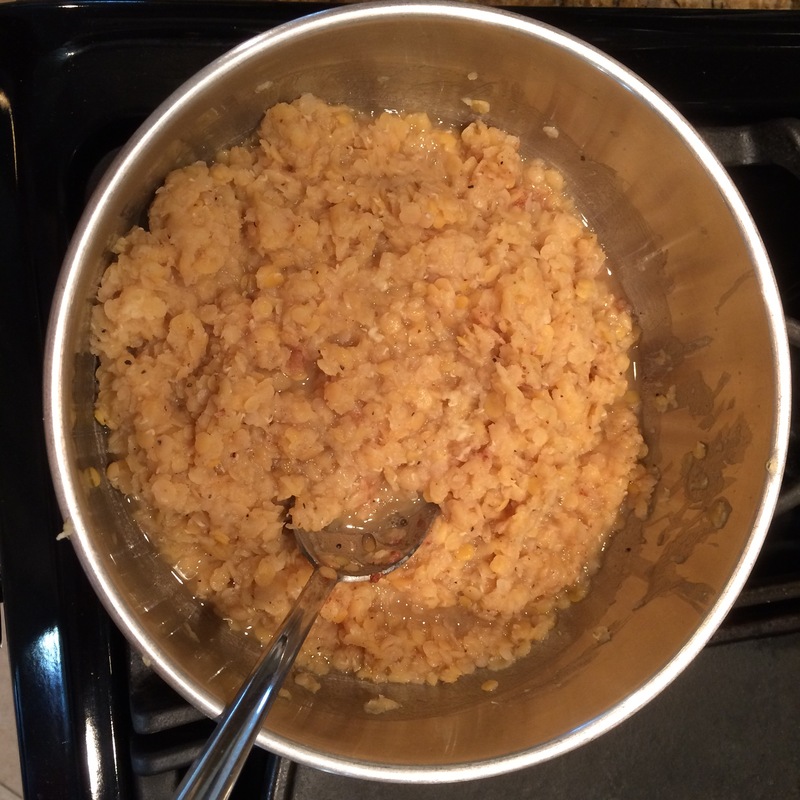 What is nice about the red lentils is that they break apart, and then can be used like a spread. If you are not already acquainted with Dolly, please go and check out her wonderful blog. I am a big fan! Wash and rinse lentils. Add water. Cook until tender. Add spices. The secret is to make sure not to add too much water. I actually did, as you can see from this picture, so I needed to drain the water out before adding the spices. Lentils cooking in the pot. I have been eating it this week, and it is delicious served with rice or on crackers. Thank you Dolly!